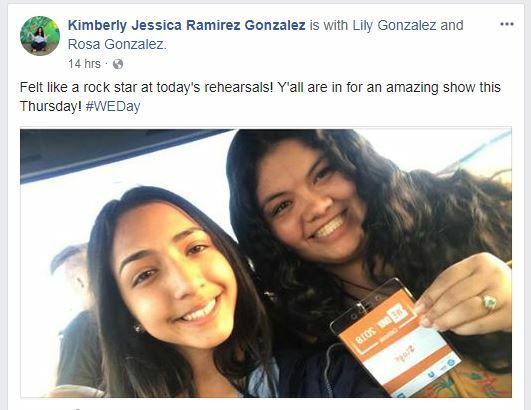 Kimberly Ramirez Gonzalez will speak to thousands of youth at WE Day California April 19. Kimberly Ramirez Gonzalez has been advocating for youth for four years and she is committed to dedicating the rest of her life to doing so. The third-year UC Merced student takes the stage April 19 alongside world-renowned entertainers and social activists such as Morgan Freeman, Jennifer Aniston and Selena Gomez at WE Day California. The all-day event, held at The Forum in Inglewood, celebrates the power young people have to make a difference by giving them the tools and inspiration to take social action, empower others and transform lives — including their own. It began nine years ago and has turned into a series of 19 stadium-sized events held across the United States, Canada, the United Kingdom and the Caribbean. Event organizers invited Ramirez Gonzalez to share her personal experiences that led her to create Girls United, a high school program focused on empowering at-risk young women. The program provides a space for freshmen and sophomore high school girls who are experiencing or have experienced domestic violence, drug abuse, depression, eating disorders or gang affiliation to feel heard and heal. “I think it is important that people like me — a low-income, first-generation woman of color and immigrants’ daughter — be given a platform like this to spread the powerful message that ‘you can change the world, no matter where you come from,’” Ramirez Gonzalez said. This isn’t the first time the sociology major from Napa has spoken to large groups about the importance of youth-led action. She has presented at events including Santa Rosa’s Youth Led Action Conference and Napa Valley TEDx. 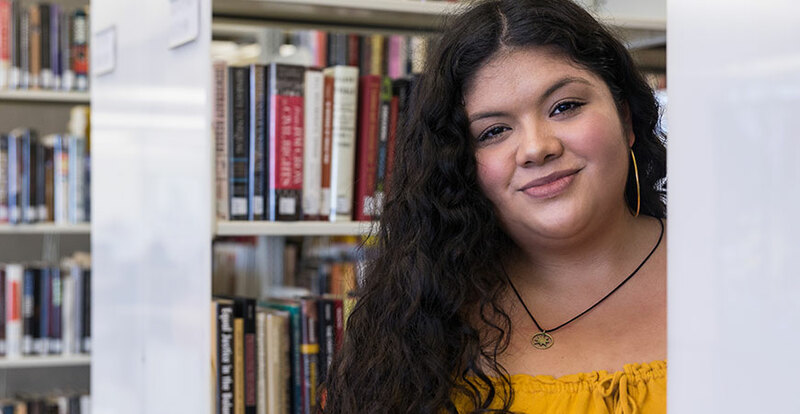 In addition to her civic involvement and academic course work, Ramirez Gonzalez is involved in numerous other areas on campus that feed her passion for helping others. She works as an office assistant for Housing and Residence Life providing support to first-year and new transfer students, as well as other continuing students who live on campus. She is the community service coordinator for Phi Alpha Delta, the campus’s professional pre-law fraternity and will serve as the its president in the fall. I hope to empower youth to recognize and utilize their power to organize their own communities, block-by-block — especially queer, at-risk and undocumented youth and youth of color. In 2017, she interned with the UC Merced Law Clinic and helped found the new Immigration Law Clinic on campus. Last year, Ramirez Gonzalez was also awarded the prestigious Cultural Vistas Fellowship allowing her to do advocacy work for women’s and children’s rights in Buenos Aires. She received additional grants that gave her the opportunity to travel to seven Latin American countries last year — Argentina, Chile, Uruguay, Peru, Ecuador, Colombia and Costa Rica — where she immersed herself in different cultures. She also represented UC Merced at the University of California Student Association student lobbying conference in Sacramento last month to promote mental health resources and address food and housing insecurities and has also represented the campus at several national conferences.